If you trade commodities or follow their prices, it is likely you have seen two different quotes for sugar that trades on U.S. futures markets. While three various types of wheat trade in the U.S. why should sugar be any different? However, there is a difference between sugar and wheat because there are three distinctly different types of grain that warrant three separate price structures. The case in sugar is different as the sweet commodity is homogenous. The two sugar futures markets are world sugar #11 and U.S. sugar #16. You may be surprised to find out that the U.S. sugar price is substantially higher than the world sugar prices – at times, twice as much. While the price differential between the two sugar contracts may lead one to believe that the U.S. produces the Rolls Royce of sugar, the sweet commodity is virtually the same around the world. The discrepancy in prices is due to subsidies and a tariff program that supports U.S. sugar farmers. Sugar production in the U.S has been around for a couple of hundred years, but the climate in the U.S. is not well suited for growing the staple commodity. Therefore, it is more costly to produce in the U.S. than other countries like Brazil and India that have more suitable climates for production. 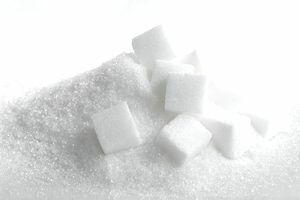 Sugar lobbyists in the U.S. have been able to arrange a sweet deal for sugar farmers in the U.S. The complex details of sugar subsidies are a subject of heated debate as the government guarantees a lucrative price for sugar producers and limits sugar imports from other nations. U.S. companies have to buy U.S. sugar at inflated prices. The high price of U.S. sugar could be responsible for changes in manufacturing. Companies like Coca-Cola turned to high fructose corn syrup as a substitute for plain old sugar. I wrote an article that outlines the massive amount of subsidies given to companies to produce ethanol. Corn is the primary ingredient in ethanol causing an increase in demand for corn in the United States. Corn is also the main ingredient in high-fructose corn syrup. Therefore, U.S. taxpayers are supporting artificially high prices for sugar and corn. The subsidies create higher prices for products containing corn and sugar that we purchase at the supermarket, so taxpayers pay twice. Consumers have been the ultimate losers when it comes to corn and sugar subsidies. The price of sugar is not a national security matter. Commodity markets are efficient; agricultural staples grow in areas where the climate is suited to grow the best crops at the lowest price. However, this is not the case when it comes to U.S. sugar production. World sugar costs less than U.S. sugar. The two sugar contracts are identical when it comes to the commodity but not when it comes to price. The U.S. sugar market an example of the effect of politics and government policy on commodity markets. The world’s largest unsubsidized producer of sugar is Brazil, and they price basis the world or #11 price. Thailand is also an unsubsidized producer of the sweet commodity.There are also other sugar futures contracts that trade on futures markets around the world such as “white” sugar or Sugar #5 that trades on ICEEU. Subsidized prices are not exclusive to the sugar market. In fact, many nations subsidize the production of commodities as a matter of national security. These countries seek to guaranty that even if the price of a commodity falls, their citizenry will have access to that staple commodity. If the price of a raw material falls below its production cost, a producer in a country without subsidies may decide to grow a more profitable crop on their land. A decrease in production for economic reasons could lead to shortages of a strategic commodity. With subsidies, the theory is that the producer will receive a price that guarantees a profit each year in exchange for providing a steady supply of the commodity for the good of the people and government. As you can see, there are pros and cons when it comes to the subsidized production of staple commodities. While subsidies are directly by the government to producers, they are ultimately funded with tax revenues. These arrangements are often the subject of debate within a government and between candidates for public office. When Is Grilling Season in the United States?